SAN FRANCISCO — If the prospect of flying holds all the appeal of a cross-country bus trip, the $6,500, lipstick-red leather Egg chairs at San Francisco International Airport’s Terminal 2 are intended to return some long-lost glamour to air travel. More Standard Hotel than standard airport gateway, T2, as it is known here, is one of the few terminals renovated top to bottom since the 9/11 terrorist attacks and represents an ambitious attempt by the airport and airlines to take both stress and carbon out of air travel. The $383 million renovation gutted a drab 1950s-era building that last served as the international terminal before being shuttered more than a decade ago. Even compared with more contemporary terminals at San Francisco International, T2 represents a new approach to airport design. It opens on Thursday. The words delight, joy and flying do not usually appear in the same sentence. But airport officials, airlines and architects said that they put as much emphasis on redefining the travel experience as on lessening its environmental impact. 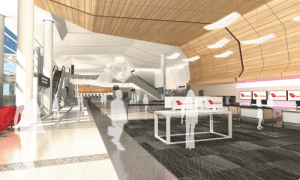 “We wanted this to feel like a San Francisco terminal and not a terminal anywhere else in the world,” Raymond Quesada, an airport project manager, said as he stood in the soaring, light- and art-filled ticket lobby shared by Virgin America and American Airlines, the terminal’s two tenants. Those San Francisco values include a city mandate to achieve at least LEED Silver status for the renovation. LEED — Leadership in Energy and Environmental Design — is a rating system administrated by the United States Green Building Council that ranks structures according to points earned for energy efficiency, water conservation and other environmentally beneficial attributes. Airport officials intend to apply for LEED Gold certification, and if it is awarded, T2 will be the first airport terminal in the United States to achieve such a ranking, according to Ashley Katz, a spokeswoman for the building council. Drivers of hybrid and electric cars get preferential parking in the nearby garage, and there are vehicle-charging stations for the electric cars. Cool air seeps from perforated white wall panels in the terminal rather than being forced down from the ceiling. The system, called displacement ventilation, cuts energy use by 20 percent because the air does not need to be cooled as much since it displaces the rising warmer air, Mr. Quesada said. Reclaimed water is pumped into the restrooms, reducing water consumption by 40 percent. The abundant natural light through walls of windows makes most daytime artificial lighting unnecessary. Passengers are encouraged to carry reusable bottles and fill them at blue “hydration stations” in the terminal rather than buy throwaway bottled water. Under their leases, food sellers must use utensils and packaging that can be composted, and compost bins are prominently displayed in the terminal. The airport scores more LEED points for making the green experience educational through signs and even a mobile phone tour. But passengers will probably pay most attention to the terminal’s food, fashion and flow, all of which reflect the esthetic of Virgin America, which has its headquarters in San Francisco. 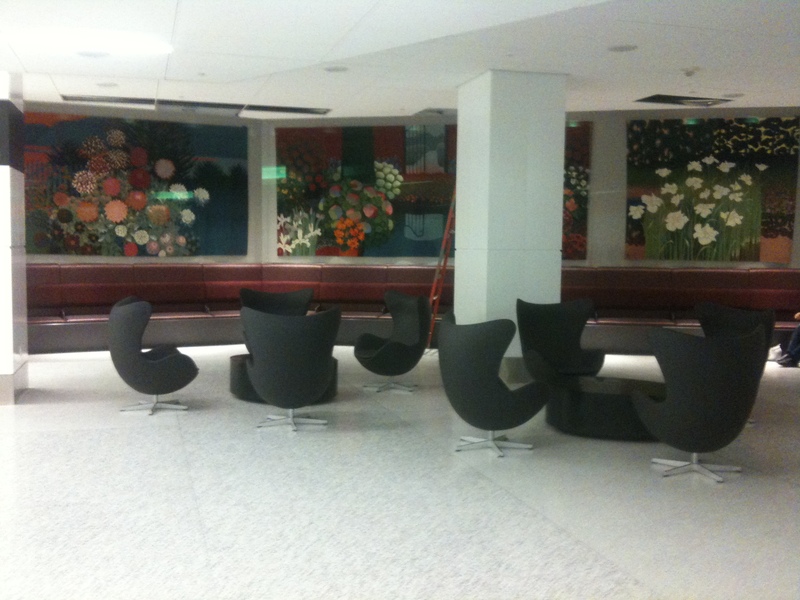 The neon mood lighting found on Virgin planes is mirrored in the lobbylike ticketing area, where pods of those high-backed, Danish-designed Egg chairs are clustered around sculptures and paintings by local artists. I wrote this story for Reuters, where it first appeared on November 29, 2010. Upping the ante in the greener-than-thou sweepstakes, San Francisco is building what would be the nation’s first LEED Gold-certified airport terminal. LEED — Leadership in Energy and Environmental Design – is a program run by the United States Green Building Council that awards certification to buildings that meet criteria for sustainability, energy efficiency, water use and other factors. The revamped Terminal 2 at San Francisco International Airport, which will be home to Virgin America when it opens next spring, is designed to cut energy use by 20 percent and will feature a reclaimed water system. Ninety percent of the debris from the demolition of the old terminal is being recycled, according to the airport. Hybrid car drivers will get preferential parking (though passengers can take the train to and from the airport) and the terminal will offer “hydration stations” so people can refill their reusable water bottles once they make it through security. And fittingly for the birthplace of California cuisine, the terminal’s restaurants will sell locally grown organic food.